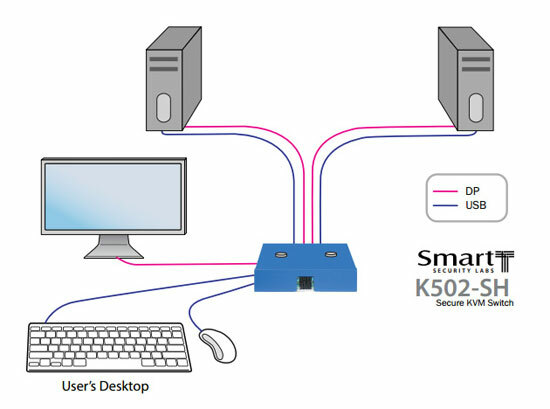 The SmartAVI K500-SH series of secure KVMs are the only secure KVM switches that feature DisplayPort version 1.2 functionality, while delivering the most protections and separations between connected computers on the market. As a result, the K502-SH eliminates points of vulnerability that have plagued other KVM units. With two connected computers, the K502-SH offers impressive levels of connectivity even when linking computers that are on different levels of security clearance and Internet access. The K502-SH uses unidirectional optical data diodes to prevent any potential leakage between the highly-isolated peripheral channels. This KVM can also be used to securely filter and lock USB ports, preventing data export/import through mass-storage devices by hardware. Additionally, the K500-SH features a patented auxiliary channel firewall that protects against internal security vulnerabilities. Every K502-SH secure KVM switch is rigorously and extensively tested to ensure it will remain stalwart against any known form of KVM security attacks. The unit has been certified to meet EAL 4+ standards to assure it provides the highest level of security possible. Question: Hi. Will this work with a ASUS Swift PG278Q? Said display uses dp2.0 and can run 2560x1440@144hz (I'm driving it with a pair of nVidia Titan Blacks in SLI). While I'd love to have a displayport switch so that I can share the display between my laptop and my game rig, it is surely obvious that I don't want to degrade a main feature of the monitor which is of course its refresh at the resolution. The spec's are vague in this regard. Answer: Thank you for your inquiry. We have reached out to the manufacturer and will update this post when we receive clarification on the refresh rates supported. Update:According to the manufacturer, this device does not support DisplayPort 2.0 refresh rates. It will reach the resolutions you require, but only at 60Hz. Question: Hello, I would like to purchase this device. I have concerns about the security features. We are a scientific research group at a university, data is commonly moved between various scientist via USB memory sticks external USB hard disks etc. From what I read these devices would be blocked and therefore not usable. I this correct? If so can this function be bypassed or disabled? Answer: Thank you for your inquiry. Your concerns are warranted. This particular DisplayPort KVM is suitable for the highest security levels used by military and other sensitive applications. Unfortunately, one of the main ways to penetrate a system through KVMs is via a USB port, so that particular security feature is not configurable. That being said, to use a USB thumb drive or other storage device with a KVM, you will need to have a pass-through USB port designed specifically to share non keyboard/mouse devices. One such device is the AV4PRO-DP-US (https://www.kvm-switches-online.com/av4pro-dp-us.html. This would be one option if all your connected devices have native DisplayPort support. If you would like additional assistance in selecting an appropriate KVM, please give us a call at 1-877-586-6654 or contact us via the online chat feature to discuss your project in greater detail. Finding the right KVM switch can be confusing and we would love to help. Question: DisplayPort 1.2 compliant? Does that mean I can pipe video from a DisplayPort 1.2 compliant video card into one of the inputs then use a DisplayPort Multistream Hub from the output to support multiple monitors? Answer: Thank you for your inquiry. Unfortunately, we have just confirmed with the manufacturer that this device does not support multi-streaming for video output to a multi-monitor setup. Question: Is it possible to connect 2 PCs with only one printer using this switch? Some KVM switches include built in USB Hub compatibility - separate USB port(s) that can be switched between the connected devices. The SmartAVI K502-SH does not include this feature, which restricts the ability to share a device like a printer. Excluding switchable USB ports from secure KVM switches is considered a feature to ensure true data path isolation in secure environments. I am not aware of a secure KVM that features a regular non blocked USB hub. If you just need a DisplayPort KVM with the ability to switch a printer, you can find a variety of DisplayPort KVMs with USB hubs on the DisplayPort KVM page - I.e. SmartAVI DPN-4P or Adder AV4PRO-DP-US.